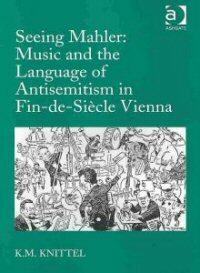 Seeing Mahler: Music and the Language of Antisemitism in Fin-de-Siècle Vienna expands upon K. N. Knittel’s pathbreaking work on the reception of Mahler’s conducting, published in 19th Century Music in 1995 and 2006. The book’s trajectory has a clear rhetorical strategy, moving from explicit and offensive accounts of the Jew’s body to, in my view, speculation on how musical discourse served the cause of antisemitism, while concluding with ruminations on anti-Jewish prejudice in the United States today. Ironically, the resistance Mahler faced as a Jew (or merely perceived that he faced, Daniel Jütte has recently argued in a paper on Jews at court) in aspiring to become director of the Court Opera, is all but ignored. Rather, Knittel moves into the important but murky subject of criticizing music because it sounds Jewish. The introduction (chapter 1) positions Knittel’s work in the crossfire of musicological debates over antisemitism and studies of Nazism, with an ambitious thesis: “For those critics writing while Mahler still lived in Vienna, Jewishness was the fact that determined how Mahler would behave, look, speak, walk, and conduct, and how he would write music” (49). Conceding that “a number of Mahler’s Viennese critics were Jewish,” Knittel suggests that the Jewish critics “desperately wanted to show their understanding of the dominant discourse” (8), and therefore participated in antisemitic rhetoric. In fact, the majority of critics she consulted (based on her listing on pp. 169-172) were Jewish. Chapter 2 unfolds in captivating detail, yet its case studies do not speak to one another—from antisemitic portrayals of the Jew’s body, but not Mahler’s (section 1), to the essay accompanying the 1922 edition of Mahler photographs, penned by the composer’s friend and collaborator Alfred Roller, which Knittel dismisses as defensive in portraying Mahler as Aryan (section 2), to the vitriol of Alma Schindler, antisemitic even in her attraction to Mahler and other Jews (section 3). Chapter 3 examines Richard Wagner’s article “Das Judentum in der Musik,” published anonymously in the Neue Zeitschrift für Musik in 1850 and in a revised form, under his name, as a brochure in 1869. Knittel believes that the Wagner text became “a handbook or guide for describing the music of Jewish composers” at the fin de siècle (50). Unfortunately, she does not engage with the extensive German-language literature on the reception of Wagner’s essay. How might critics have encountered a text that was, according to Jens Malte Fischer, reprinted only once before the Third Reich—and that was in Weimar in 1914, four years after Mahler’s death? Consulting the original article in a journal from a half century earlier, or tracking down the essay in the fifth volume of Wagner’s collected writings (did newspaper staff or critics themselves purchase the complete writings? ), implies a more specialized readership. Moreover, given its negative reception in 1869, what led critics to turn to Wagner’s vocabulary and claims? The only commentary I know did not appear until 1920, and from a rightwing nationalist press (penned by from Karl Grunsky, of similar political and aesthetic inclinations). Knittel’s two longest chapters contribute important archival material to fin-de-siècle Vienna reception studies. Chapter 4 examines the reactions to Mahler’s symphonies—interestingly, not his Lieder. It was the successful premiere of the Kindertotenlieder, for example, that led some reviewers to consider Mahler a composer, not a conductor who composed. His expressive and masterful control of the German language, along with the vivid yet restrained orchestration, showed Mahler’s “German” side, as proponents later put it, stressing the balance between Mahler as Jew and as German. Knittel, moreover, limits herself to the first performances, whereas subsequent performances—which implied that Mahler’s symphonies might become established in the repertoire—incited the harshest reviews by critics such as Robert Hirschfeld. Her bold move was to include a chapter on Richard Strauss, whose music faced similar charges as Mahler’s, despite the fact that he was not Jewish: chapter 5 documents in rich detail the Viennese reception of Strauss’s tone poems and the comparisons critics made between Mahler and Strauss during the weeks in November and December 1904, when Viennese audiences heard six performances of their music. The brief conclusion urges a re-examination of more recent commentators, especially Theodor Adorno, as perpetuating the same antisemitic tradition, even as they embraced Mahler’s music. Knittel launches into the chapter via a long anecdote about a recent plane trip she found “excruciating” due to the reactions of fellow passengers towards a group of orthodox Jews that included a family with two babies and a toddler, whose car seats forced an inconvenient row change. The details Knittel recounted suggest to me less that “the Jew is still . . . subject to the same ridicule that they have endured for centuries” (160) but rather underline the subjectivity and therefore immensely complicated nature of discerning antisemitism, in both contemporary life and in fin-de-siècle music criticism. Knittel’s modus operandi is to appose statements from concert reviews with passages from “Das Judentum in der Musik,” yet in ways that can be contrived. Hans Liebstöckl observed about Mahler’s Sixth Symphony, “The right mood is missing, and so too the tenderness, happy inwardness, and the calm of creation” (my translation). The raw intensity of the symphony, perhaps with the exception of the Andante, might reasonably provoke such a description. To me, pace Knittel (84-85), Liebstöckl does not “echo” Wagner’s attack on the “prickling unrest” in Jewish music. Further on, Knittel argues that Liebstöckl’s straightforward criticism that music quotes from other works can “be seen as illustrating Wagner’s assertion that Jews hurl together diverse forms and styles from every age and every master” (92). The one-to-one correspondence seems impoverished, missing for example the resonance with the more general nineteenth century tradition of criticizing musical allusions (as Christopher Reynolds calls them). Knittel devotes the first section of chapter 4 to the debate between program music and absolute music—which arose before and independent of Wagner’s antisemitism. This was an important issue for Mahler’s early reviewers but, so far as can be discerned from the excerpts Knittel provides, did not provoke any Jewish stereotyping. However, she draws a parallel between the criticism of hidden program music and the allusion to Jewish deceit in the original, unpublished ending of Thomas Mann’s “Blood of the Walsungs.” (In that story, Siegmund [who is Jewish] boasts of “robbing the non-Jew,” his future brother-in-law, by consummating his passion with his sister—a passage that the author duly changed after the editor objected.) The section concludes with a diversion from the book’s otherwise tight argument: Knittel references commentators finding “hidden” programs in the music of Berg—who was not Jewish—in the years following the 1976 discovery of a program to the Lyric Suite. At various points, “Blood of the Walsungs” serves as context for interpreting Mahler’s critics. Knittel correctly identifies the story as from 1905. Yet while this date is relevant to Mann’s biographers, or historians for whom a work reflects a general “spirit” (or Geist) of its generation, the text itself did not influence views towards Jews at the fin de siècle. Mann withdrew the story shortly before its 1906 publication in Berlin. A bootleg copy, compiled by a bookkeeper’s apprentice in Munich after the Berlin publisher used the discarded page proofs as packing paper, had a very limited circulation. Even the first edition hardly warrants a place in cultural history: Mann authorized 530 copies, and for private sale only. The first public access to the story was in 1931, in French translation, and not until 1960 in German. Occasionally, a mistranslation contributes to what I see as a tendency to exaggerate or inject anti-Semitism into negative reactions to modern music. For example, the idiomatic expression “auf kaltem Wege” (“in a cold style”) refers to effort or strain. Thus, in asserting that “Mahlers Sinfonien sind auf kaltem Wege erzeugt,” Max Vancsa does not “state that Mahler’s symphonies are ‘cold.’” Vancsa—like virtually every early commentator—did not like the Sixth Symphony. Is Knittel justified in concluding that the “‘moral’ of Vanca’s review is . . . ; Mahler will reveal himself eventually as a Jew—by writing banal or second-hand melodies, with orchestration—no matter how hard he may try to write a ‘normal’ symphony” (91)? While such explanations may not be entirely satisfactory, they nonetheless repeatedly provoke the important question: what constituted antisemitism for the generation of music critics active circa 1900? Quite apart from its sometimes idiosyncratic take on antisemitism, the book will stimulate lively debates within the field of reception studies, specifically, the parameters for analyzing concert reviews, as opposed to other texts. Given the extended length of these reviews, are we justified in extrapolating a critic’s views beyond what s/he articulated? Julius Korngold, an assimilated Jew, supporter of Mahler, and writer for the authoritative Neue Freie Presse, is raised as an example of a critic who “reveals” that Mahler’s “work . . . failed as a totality” (85) on the basis of the following reservation: “The more precisely Mahler strives for an outwardly classical form, the more—we will not continue this statement.” Ambivalence, however, is a common reaction to new music. A related challenge is determining what role the particular musical work might have had in promulgating certain vocabulary or mindset: might a genuine response to music be confused with antisemitism? My own encounter with the Sixth Symphony is similar to Korngold’s. Korngold’s expressive language—hearing a mood of “realism” and “nerve-churning tensions,” and observing that the score lacks the “variety and vigor of invention”—seems authentic and appropriate, particularly at a first hearing of an immensely complicated score. It does not necessarily reflect antisemitism on the part of this assimilated Viennese Jew. Yet according to Knittel, Korngold here “gives the impression of not really knowing what he is trying to say, or what problems he really finds with the music” (86). Musical description is necessarily imprecise. The question remains: when does expressive language fail to serve the task of the critic and instead become an arsenal of antisemitism? Knittel is explicit about her approach to concert reviews. “I wish to emphasize my premise that early reviewers were reacting not to his music but rather to the figure of Mahler” (13). How can we show that critics shirked their professional responsibility in order to convey reactions to a composer’s identity, rather than to a new musical work? Critic Robert Hirschfeld’s perceptions of expressive rupture and radical contrast in Mahler’s music seem accurate—only I interpret these as virtues, not flaws. Negative reactions, cast in vivid journalistic prose, often evoke one stereotype or another. Thus the very same description demonstrates, in Knittel’s view, that Hirschfeld is claiming that Mahler’s music, “like the Jews themselves, can only ‘pose’” (136). But can’t one read Hirschfeld’s comparison of Mahler to George Bernard Shaw within this review as defusing any notion of troping Mahler as Jew? Likewise, Vansca’s attack on Mahler, quoted at length, compares the opening movement of the Third Symphony to a painting by his Belgian contemporary, the neo-Impressionist Théo van Rysselberghe. This maneuver, if anything, averts any antisemitism by comparing the modernist composer to a non-Jewish modernist painter. Whereas Knittel deliberately contests the very notion of a reception history that seeks to disentangle political differences between critics and newspapers, her alternative may be extreme to others: she links ideas without tracing particular lines of influence. A more general problem with cultural studies that focus on artistic products is that the aesthetic dimension as such often disappears. How did critics actually hear this music, and how did its novelty affect their ability to comprehend and judge? Given the title of her book, it is surprising that Knittel does not address the phenomenon understood as viewing music, which was one way of criticizing Mahler’s vivid orchestration—the bold colors that allegedly distracted listeners from the more spiritual content of music. Although her interests veer towards a political reading, the very sources she quotes generously, with German original in the footnotes, will inspire further consideration of how this generation of highly trained critics captured powerfully the novel sounds of music that we still find gripping today. Knittel’s book, or any study of anti-Semitism in musical reception, prompts us to ask the basic question: is it possible to criticize music (by a Jew) without being accused of antisemitism? Vancsa accuses Mahler of being a performer who has technical mastery but lacks genuine originality: I, too, have identified this dichotomy with antisemitic claims about Mahler. But then as now, listeners and critics should be free to reject music on aesthetic grounds. Yet whatever one’s methodological quibbles—and mine are numerous—the book stands as a major contribution to Mahler scholarship, an effective contextualization in artistic, literary, and political trends. Lucid and written with verve, the book is a pleasure to read and will spark an important debate. Karl Grunsky, Richard Wagner und die Juden, Deutschlands führende Männer und das Judentum, vol. 2 (Munich: Deutscher Volksverlag, 1920); the book was praised as a harbinger of National Socialism by Hans Gansser, “Die musikalische Erneuerungsbewegung vor der deutschen Revolution,” Zeitschrift für Musik (Sept. 1935): 1020. John Whiton, “Thomas Mann’s Wälsungenblut: Implications of the Revised Ending,” Seminar: A Journal of Germanic Studies 25, no. 1 (1989): 37-38. Thomas Weber, Hitler’s First War (Oxford: Oxford and New York, 2010). Anatole Leroy-Beaulieu, Israel among the Nations: a Study of the Jews and Anti-Semitism, trans. Frances Hellman (New York: G. P. Putnam’s sons, 1895), pp. 240-250.